Hank Williams died in 1953, Buddy Holly in 1959, Patsy Cline in 1963, Sam Cooke in 1964, Otis Redding in 1967, Janis Joplin in 1970, Jim Croce in 1973, Elvis in 1977, and John Lennon in 1980. They were all popular singers who died at relatively young ages. Some of them were also fine songwriters. Many other popular musicians have died young. I’m sure I left out some of your favorites. I left out some of mine, too. Now Glenn Frey is gone. He was sixty-seven when he died on January 18. There was a time when I wouldn’t have thought of sixty-seven as young, but now that I can see it just ten years over yonder way, I do. Frey was a founding member of the Eagles. Don Henley and he were the two constants in the band that provided much of the soundtrack for my high school and college years. From “Take It Easy” (1972) to “Long Run” (1979), the Eagles’ songs played in the background as my friends and I tried to navigate adolescence and move into adulthood. Those records were good companions. Here’s a very partial list of the songs that Frey co-wrote: “The Best of My Love,” “Desperado,” “Hotel California,” “I Can’t Tell You Why,” “Life in the Fast Lane,” “Long Run,” “Lyin’ Eyes,” “New Kid in Town,” “One of These Nights,” “Take It Easy,” “Take It to the Limit,” and “Tequila Sunrise.” They’re all great songs. “New Kid in Town,” which Frey co-wrote with Henley and J. D. Souther, may be the closest thing to a perfect pop/rock song ever produced. you get too careful with the steps you choose. I’ve always heard the song as a caution against allowing life to become stale and dull. So I haven’t. I suspect that if classic rock stations still exist in a hundred years, they’ll still be playing the songs that Glenn Frey co-wrote and on which he played and sang. I know that if I have any memory in my geriatric years, I’ll be rocking (double meaning intended) to the songs of Glenn Frey and the Eagles. 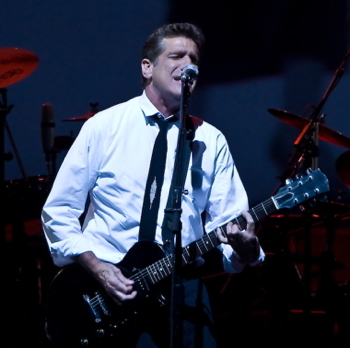 Glenn Frey will live for as long as the world continues. That’s because he will live on in his songs. Now, before some of y’all get your halos twisted in a knot, let me say that I do believe in everlasting life. I believe in heaven. I’m just saying that there are also other ways to live on, and one of those ways is through the contributions we make to people’s lives. I’m grateful for the contributions Glenn Frey made to mine. As long as I and many others can remember, listen, and think, he’ll live on. We can’t all be successful singers and songwriters. But we can all make a contribution to the lives of our families, our friends, and our community. We can all share our love. How will you live forever? Michael Ruffin is husband to Debra and father to Joshua (Michelle) and Sara (Benjamin). A graduate of Mercer University and Southern Baptist Theological Seminary, he has previously served as a pastor and as a university professor. He lives on the Ruffin Family Farm in Yatesville, Georgia. You can visit and communicate with him at MichaelRuffin.com. He is the Connections Series Curriculum Editor.